Wildlife biologists are warning Upstate residents and visitors not to closely approach a young bull elk that has wandered into South Carolina from North Carolina. 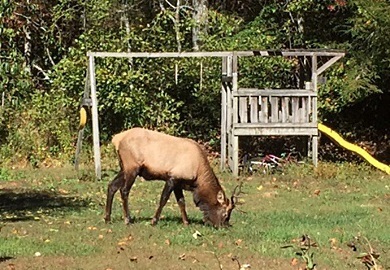 A young bull elk grazes in a yard near Sunset in northern Pickens County. The elk, one of a herd of about 150 in and around the Great Smoky Mountains National Park in North Carolina, was first seen in South Carolina Oct. 21. Biologists expect the elk to eventually return to the North Carolina herd. The first official sighting of an elk in South Carolina was made on Friday, Oct. 21 at Camp McCall, a South Carolina Baptist Convention camp on US 178 in northern Pickens County. On Oct. 22, the elk was seen at the Sunset Post Office on SC 11, and on Oct. 23 it was observed in the Nine Times Community, also in northern Pickens County. On Oct. 23, it was seen at The Reserve at Lake Keowee golf course, which is near SC 133 in Sunset. Numerous social media postings have been made with photos of the elk, some with people feeding the animal. "People get a false sense of security, because elk don't mind being approached," said Justin McVey, a wildlife biologist with the N.C. Wildlife Resources Commission. "But they are still wild animals and can be very dangerous. All it would take is for that elk to swing its antlers, and it could really hurt somebody." Elk once roamed the southern Appalachian mountains and elsewhere in the eastern United States. They were eliminated from the region by over-hunting and loss of habitat. The last elk in North Carolina was believed to have been killed in the late 1700s. By 1900, the population of elk in North America dropped to the point that hunting groups and other conservation organizations became concerned the species was headed for extinction. Reintroduction of elk into Great Smoky Mountains National Park began in 2001. The population around the Great Smoky Mountains is estimated at 150 elk, and there have been numerous unconfirmed sightings in the Upstate of South Carolina in recent years. Tammy Wactor, a wildlife biologist with the S.C. Department of Natural Resources (SCDNR), said legislation that was passed five years ago by the S.C. General Assembly protects elk in the Palmetto State, so they cannot be harmed. The legislation was promoted by the Rocky Mountain Elk Foundation, in anticipation of elk migrating into South Carolina. Wactor said the young bull elk, which may weigh upwards of 700 pounds, was likely pushed out of its territory in Heywood County, North Carolina, by bigger bulls. Once the young elk realizes there are no female elk in South Carolina, it will likely return to North Carolina. In the meantime, Wactor advised motorists to use caution when driving on Upstate roads where the elk might be roaming, especially at sunrise and sunset.